RSA Marketing Canada provided marketing brochure creative direction, copy, design and printing services for TVCogeco, a division of Cogeco Cable. Cogeco Inc. is a diversified telecommunications and media company that provides cable television, telephone and Internet connectivity services to consumers in parts of Ontario, Quebec, and several regions of the United States. 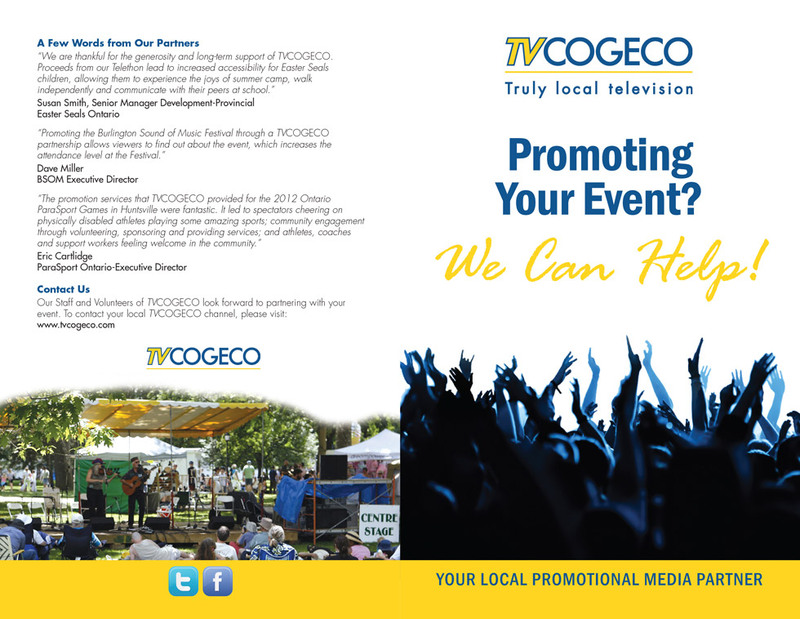 TVCOGECO is a community service provided by Cogeco. Volunteer Community Partners and staff utilize their production resources to produce local and regional television content that inform, entertain, educate and reflect our communities. RSA Marketing is a results-driven creative marketing agency based in Burlington near Toronto, Ontario, Canada. We provide on-target strategy, creative direction, design, copywriting and production for a range of marketing services including branding, websites, marketing communications, incentives, loyalty programs, and promotions. Established in 1995, Rob Stonehewer & Associates has been a long-term preferred supplier to American Express Canada and worked with Fortune 1,000 companies such as AT&T/Allstream, Castrol, Qualcomm, Sun Microsystems and TELUS, as well as many small to mid-size companies including Archmill House, Burlington Chamber of Commerce, CADA (Canadian Auto Dealers Association), Cogeco Cable, TESC Contracting and Thordon Bearings. After two decades, Rob Stonehewer rebranded his marketing agency to RSA Marketing Canada. While still providing our clients with the same results-driven, creative marketing services, RSA Marketing will now operate as a division of Rob Stonehewer & Associates Inc. Rob Stonehewer is an experienced creative director, writer and results-driven marketing professional. Together with his team, RSA Marketing provides a complete range of marketing services including brand identity, marketing communications, websites, promotions and performance improvement programs. RSA Marketing agency is based in Burlington, near Toronto, Ontario, Canada.